Successfully Added Bluetooth LED Bike Light - App Control, DIY Feature, IP56, Bluetooth 4.0, iOS And Android Support, Remote Control to your Shopping Cart. With the Cycplus Smart DIY Bicycle Taillight, you’ll be able to pimp up your ride and increase your on-the-road safety significantly. This remarkable LED Bluetooth bike light allows you to display different patterns, letting you customize your taillight while simultaneously making your presence known to other traffic users in style. The bike tail light is easy to install and can be effortlessly attached to your bike with the included brackets. Once it has been attached to your bike simply pair it with your smartphone through Bluetooth, and you’ll be all set to enjoy its unlimited lighting options. Equipped with 15 extra bright LED lights, this bike light is guaranteed to provide the needed illumination to make your presence known in the darkness. The LED tail light is compatible with both iOS and Android smartphones through its Bluetooth 4.0 connectivity. Simply download the dedicated mobile Application and you’ll be all set to select one of the many pre-selected lighting designs. Additionally, it allows you to draw and create your own designs, providing you with the possibility to fully customize your bike light according to your own style. It also comes with a miniature remote control that can be attached to your handlebars – allowing you to easily switch in between different lighting modes while on the move. Packing a sophisticated 350mAh battery, this light brings along 10 hours of illumination – enough to get through plenty of night-time bike rides without needing to worry about battery life. Recharging can be done easily through the LED’s micro USB port. 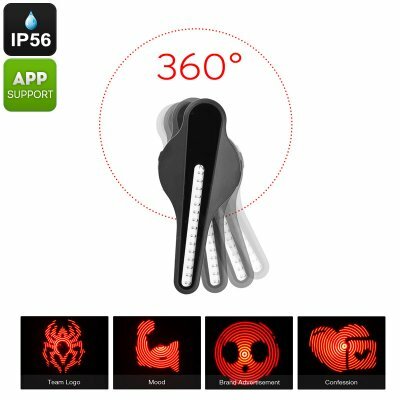 Thanks to its durable IP56 design the bike accessory is weatherproof and can be used in any environment or weather condition. Whether there is rain, snow, or dust – nothing will stop this cool electronic gadget. This Bluetooth Bike Light comes with a 12 months warranty, brought to you by the leader in electronic devices as well as wholesale electronic gadgets..
Arabic: - ضوء LED الدراجة - Chinese Simplified: - LED 自行车灯 - Czech: - LED Bike Light - Danish: - LEDEDE cykel lys - Dutch: - LED fietsverlichting - French: - Lumière LED vélo - German: - LED Fahrrad Licht - Hebrew: - אור LED אופניים - Hindi: - एलईडी बाइक प्रकाश - Italian: - Luce LED bici - Japanese: - LED 自転車ライト - Korean: - LED 자전거 빛 - Malay: - Lampu LED Basikal - Norwegian Bokmål: - LED sykkel lys - Romanian: - LED biciclete lumina - Russian: - Свет LED велосипед - Spanish: - Luz LED bicicleta - Thai: - แสงจักรยาน LED - Turkish: - LED Bisiklet ışık - Vietnamese: - Ánh sáng đèn LED xe đạp.